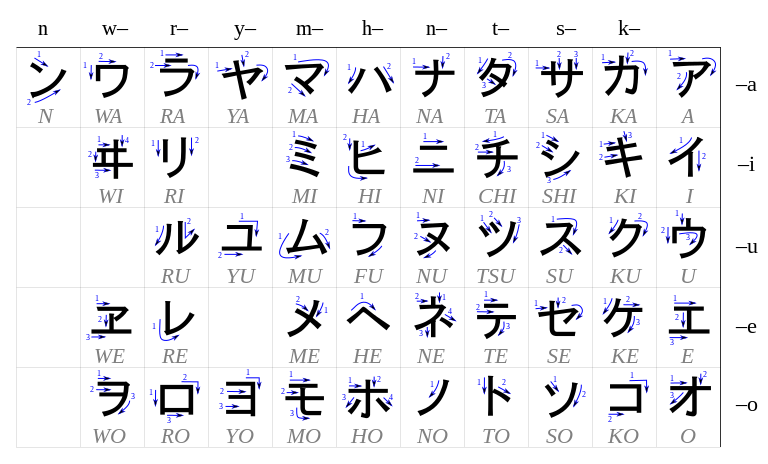 These are conceived as a 5×10 grid (gojūon, 五十音, literally "fifty sounds"), as shown in the adjacent table, read ア (a), イ (i), ウ (u), エ (e), オ (o), カ (ka), キ (ki), ク (ku), ケ (ke), コ (ko) and so on. The gojūon inherits its vowel and consonant order from Sanskrit practice. In vertical text contexts, which used to be the default case, the grid is usually presented as 10 columns by 5 rows, with vowels on the right hand side and ア (a) on top. Katakana glyphs in the same row or column do not share common graphic characteristics. Three of the syllabograms to be expected, yi, ye and wu, may have been used idiosyncratically with varying glyphs, but never became conventional in any language and are not present at all in modern Japanese. The script includes two diacritic marks placed at the upper right of the base character that change the initial sound of a syllabogram. A double dot, called dakuten, indicates a primary alteration; most often it voices the consonant: k→g, s→z, t→d and h→b; for example, カ (ka) becomes ガ (ga). Secondary alteration, where possible, is shown by a circular handakuten: h→p; For example; ハ (ha) becomes パ (pa). Diacritics, though used for over a thousand years, only became mandatory in the Japanese writing system in the second half of the 20th century. Their application is strictly limited in proper writing systems,[clarification needed] but may be more extensive in academic transcriptions. The layout of the gojūon table promotes a systematic view of kana syllabograms as being always pronounced with the same single consonant followed by a vowel, but this is not exactly the case (and never has been). Existing schemes for the romanization of Japanese either are based on the systematic nature of the script, e.g. nihon-siki チ ti, or they apply some Western graphotactics, usually the English one, to the common Japanese pronunciation of the kana signs, e.g. Hepburn-shiki チ chi. Both approaches conceal the fact, though, that many consonant-based katakana signs, especially those canonically ending in u, can be used in coda position, too, where the vowel is unvoiced and therefore barely perceptible. Small versions of the five vowel kana are sometimes used to represent trailing off sounds (ハァ haa, ネェ nee), but in katakana they are more often used in yōon-like extended digraphs designed to represent phonemes not present in Japanese; examples include チェ (che) in チェンジ chenji ("change"), ファ (fa) in ファミリー famirī ("family") and ウィ (wi) and ディ (di) in ウィキペディア Wikipedia. A character called a sokuon, which is visually identical to a small tsu ッ, indicates that the following consonant is geminated (doubled); this is represented in rōmaji by doubling the consonant that follows the sokuon. In Japanese this is an important distinction in pronunciation; for example, compare サカ saka "hill" with サッカ sakka "author". Geminated consonants are common in transliterations of foreign loanwords; for example English "bed" is represented as ベッド (beddo). The sokuon also sometimes appears at the end of utterances, where it denotes a glottal stop. However, it cannot be used to double the na, ni, nu, ne, no syllables' consonants; to double these, the singular n (ン) is added in front of the syllable. The sokuon may also be used to approximate a non-native sound: Bach is written バッハ (Bahha); Mach as マッハ (Mahha). Both katakana and hiragana usually spell native long vowels with the addition of a second vowel kana. However, in foreign loanwords katakana instead uses a vowel extender mark, called a chōonpu ("long vowel mark"). This is a short line (ー) following the direction of the text, horizontal for yokogaki (horizontal text), and vertical for tategaki (vertical text). For example, メール mēru is the gairaigo for e-mail taken from the English word "mail"; the ー lengthens the e. There are some exceptions, such as ローソク (rōsoku (蝋燭, "candle")) or ケータイ(kētai (携帯, "mobile phone")), where Japanese words written in katakana use the elongation mark, too. Technical and scientific terms, such as the names of animal and plant species and minerals, are also commonly written in katakana. Homo sapiens, as a species, is written ヒト (hito), rather than its kanji 人.
Katakana are also often (but not always) used for transcription of Japanese company names. For example, Suzuki is written スズキ, and Toyota is written トヨタ. As these are common family names, Suzuki being the second most common in Japan, it helps distinguish company names from surnames in writing. 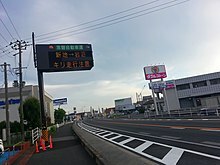 Katakana are commonly used on signs, advertisements, and hoardings (i.e., billboards), for example, ココ koko ("here"), ゴミ gomi ("trash"), or メガネ megane ("glasses"). Words the writer wishes to emphasize in a sentence are also sometimes written in katakana, mirroring the European usage of italics. The very common Chinese loanword rāmen, written in katakana as ラーメン, is rarely written with its kanji (拉麺). There are rare instances where the opposite has occurred, with kanji forms created from words originally written in katakana. An example of this is コーヒー kōhī, ("coffee"), which can alternatively be written as 珈琲. This kanji usage is occasionally employed by coffee manufacturers or coffee shops for novelty. Katakana are also sometimes used to indicate words being spoken in a foreign or otherwise unusual accent. For example, in a manga, the speech of a foreign character or a robot may be represented by コンニチワ konnichiwa ("hello") instead of the more typical hiragana こんにちは. Some Japanese personal names are written in katakana. This was more common in the past, hence elderly women often have katakana names. This was particularly common among women in the Meiji and Taishō periods, when many poor, illiterate parents were unwilling to pay a scholar to give their daughters names in kanji. Katakana is also used to denote the fact that a character is speaking a foreign language, and what is displayed in katakana is only the Japanese "translation" of his or her words. Some frequently used words may also be written in katakana in dialogs to convey an informal, conversational tone. Some examples include マンガ ("manga"), アイツ aitsu ("that guy or girl; he/him; her"), バカ baka ("fool"), etc. Words with difficult-to-read kanji are sometimes written in katakana (hiragana is also used for this purpose). This phenomenon is often seen with medical terminology. For example, in the word 皮膚科 hifuka ("dermatology"), the second kanji, 膚, is considered difficult to read, and thus the word hifuka is commonly written 皮フ科 or ヒフ科, mixing kanji and katakana. Similarly, difficult-to-read kanji such as 癌 gan ("cancer") are often written in katakana or hiragana. Some instructors teaching Japanese as a foreign language "introduce katakana after the students have learned to read and write sentences in hiragana without difficulty and know the rules." Most students who have learned hiragana "do not have great difficulty in memorizing" katakana as well. Other instructors introduce katakana first, because these are used with loanwords. This gives students a chance to practice reading and writing kana with meaningful words. This was the approach taken by the influential American linguistics scholar Eleanor Harz Jorden in Japanese: The Written Language (parallel to Japanese: The Spoken Language). Katakana is commonly used to write the Ainu language by Japanese linguists. In Ainu katakana usage, the consonant that comes at the end of a syllable is represented by a small version of a katakana that corresponds to that final consonant followed by an arbitrary vowel. For instance "up" is represented by ウㇷ゚ (ウプ [u followed by small pu]). Ainu also uses three handakuten modified katakana, セ゚ ([tse]), and ツ゚ or ト゚ ([tu̜]). In Unicode, the Katakana Phonetic Extensions block (U+31F0–U+31FF) exists for Ainu language support. These characters are used for the Ainu language only.
) is a katakana-based writing system once used to write Holo Taiwanese, when Taiwan was under Japanese control. It functioned as a phonetic guide for Chinese characters, much like furigana in Japanese or Zhùyīn fúhào in Chinese. There were similar systems for other languages in Taiwan as well, including Hakka and Formosan languages. Unlike Japanese or Ainu, Taiwanese kana are used similarly to the Zhùyīn fúhào characters, with kana serving as initials, vowel medials and consonant finals, marked with tonal marks. A dot below the initial kana represents aspirated consonants, and チ, ツ, サ, セ, ソ, ウ and オ with a superpositional bar represent sounds found only in Taiwanese. ^ a b c Theoretical combinations yi, ye and wu are unused . ^ a b c The characters in positions wi and we are obsolete in modern Japanese, and have been replaced by イ (i) and エ (e). The character wo, in practice normally pronounced o, is preserved in only one use: as a particle. This is normally written in hiragana (を), so katakana ヲ sees only limited use. See Gojūon and the articles on each character for details. ^ a b c d e The ヂ (di) and ヅ (du) kana (often romanised as ji and zu) are primarily used for etymologic spelling , when the unvoiced equivalents チ (ti) and ツ (tu) (often romanised as chi and tsu) undergo a sound change (rendaku) and become voiced when they occur in the middle of a compound word. In other cases, the identically-pronounced ジ (ji) and ズ (zu) are used instead. ヂ (di) and ヅ (du) can never begin a word, and they are not common in katakana, since the concept of rendaku does not apply to transcribed foreign words, one of the major uses of katakana. Katakana was developed in the 9th century (during the early Heian period) by Buddhist monks by taking parts of man'yōgana characters as a form of shorthand, hence this kana is so-called kata (片, ‘partial, fragmented’). For example, ka (カ) comes from the left side of ka (加, literally ‘increase’, but the original meaning is no longer applicable to kana). 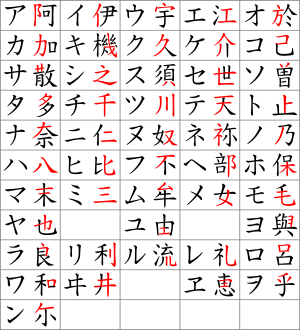 The adjacent table shows the origins of each katakana: the red markings of the original Chinese character (used as man'yōgana) eventually became each corresponding symbol. In addition to the usual full-width (全角, zenkaku) display forms of characters, katakana has a second form, half-width (半角, hankaku) (there are no kanji). The half-width forms were originally associated with the JIS X 0201 encoding. Although their display form is not specified in the standard, in practice they were designed to fit into the same rectangle of pixels as Roman letters to enable easy implementation on the computer equipment of the day. This space is narrower than the square space traditionally occupied by Japanese characters, hence the name "half-width". In this scheme, diacritics (dakuten and handakuten) are separate characters. When originally devised, the half-width katakana were represented by a single byte each, as in JIS X 0201, again in line with the capabilities of contemporary computer technology. Although often said to be obsolete, the half-width katakana are still used in many systems and encodings. For example, the titles of mini discs can only be entered in ASCII or half-width katakana, and half-width katakana are commonly used in computerized cash register displays, on shop receipts, and Japanese digital television and DVD subtitles. Several popular Japanese encodings such as EUC-JP, Unicode and Shift JIS have half-width katakana code as well as full-width. By contrast, ISO-2022-JP has no half-width katakana, and is mainly used over SMTP and NNTP. Furthermore, as of Unicode 12.0, the following combinatory sequences have been explicitly named, despite having no precomposed symbols in the katakana block. Font designers may want to optimize the display of these composed glyphs. Some of them are mostly used for writing the Ainu language, the others are called bidakuon in Japanese. Other, arbitrary combinations with U+309A handakuten are also possible. ^ Roy Andrew Miller (1966) A Japanese Reader: Graded Lessons in the Modern Language, Rutland, Vermont: Charles E. Tuttle Company, Tokyo, Japan, p. 28, Lesson 7 : Katakana : a—no. "Side by side with hiragana, modern Japanese writing makes use of another complete set of similar symbols called the katakana." ^ "Hiragana, Katakana & Kanji". Japanese Word Characters. Retrieved 15 October 2011. ^ "明治安田生命 全国同姓調査 [Meiji Yasuda Life Insurance Company - National same family name investigation]" (PDF) (Press release). Meiji Yasuda Life Insurance Company. 24 September 2008. Retrieved 24 May 2018. ^ Tackett, Rachel. "Why old Japanese women have names in katakana". RocketNews24. Retrieved 19 September 2015.